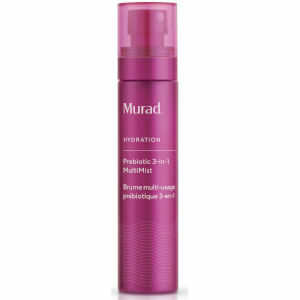 Gently refresh your complexion with the Murad Prebiotic 4-in-1 Multi Cleanser; an ultra-hydrating, gel-to-oil formula that works to promote a smooth, healthy-looking complexion by rebalancing the skin's microbiome (the collection of good and bad bacteria living on skin). Fortified with Hyaluronic Acid, prebiotic hydrating sugars and cyclic peptide (a unique cleansing agent that is 300 times more efficient than traditional surfactants), the face wash effectively removes dirt and excess oil without stripping moisture. Melts away face, eye and lip makeup, including waterproof, to reveal a fresh, clarified visage that feels super soft and nourished. Housed in a convenient pump bottle. Cruelty free. Safe for sensitive skin. Free from parabens, sulphates, phthalates, gluten, nuts, silicone, alcohol and animal derived ingredients.